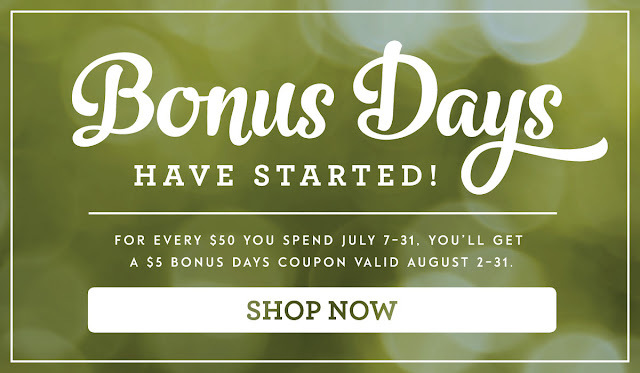 Katrina's Kreative Heart: Don't Miss Out on Bonus Days! Hey there! I pray you have all been enjoying your week so far. I'm just returning to work after a nice staycation. It sure was too short. It's always hard going back after having a few days away from it all. I did enjoy my time at home, but like all good things, it must come to an end and it's back to the daily routine. I wanted to stop by here and make sure you know about the Bonus Day's going on over at Stampin' Up! For every $50 you spend, they will email you a coupon for $5 to spend in August on anything you want! That's a package of embellishments! Sequins, Basic Jewels, White Perfect Accents and even the Metal Rimmed Pearls are $5, so don't miss out on your opportunity! And, for every order of $30 or more, using the hostess code FT9YEUVC, I will send you printed instructions and the supplies for my Christmas in July class! You will receive enough supplies to create 3 each of 3 designs for a total of 9 cards as well as the instructions. You will need to have the stamps and ink, because Stampin' Up! rules do not allow me to stamp for you, but I will provide the cardstock and embellishments needed to complete the cards. Aren't they cute? I know it seems a little early to be thinking about Christmas, but, when you make your own cards and send as many cards as I do, you have to get an early start and I thought I would help you get an early start too.